*This post contains affiliate links. We only recommend products we trust. If you choose to make a purchase through these links we may receive a small commission. This is at no additional cost to you. Thank you for supporting our blog! 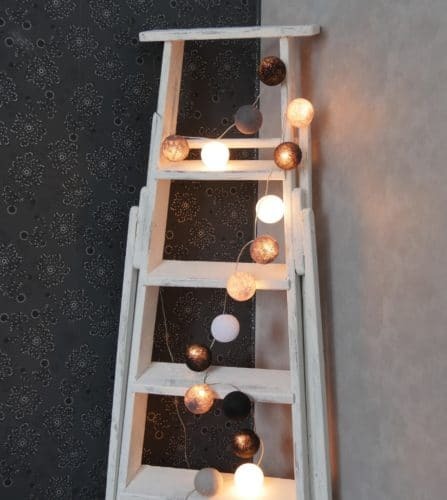 We had this really old wooden ladder in our shed and thought that it could be used as home decoration. It just needed a new coat of white chalk paint. This could be any wooden item you would love to decorate your home with. Chalk paint will work just like this on any wooden piece. You know, I just love chalk paint! It’s so easy to work with. Just wipe off the dust and dirt and start painting. Chalk paint covers up little cracks just like that. It’s also easy to paint because it won’t drip that much and doesn’t splash around. And even if you do make a little mess, then just wipe it off with a wet rag. It’ll come off even if it’s already dry. So, no worries with chalk paint. First I cleaned the ladders. I used a wet rag to wipe off all the dust and dirt. When it was completely clean and the surface was dry, I started to brush on the paint. I only did one coat of paint. That was enough as they promise on the can, too. I let the paint dry overnight. Then for the finishing touch I used a simple kitchen sponge to take off excess paint on a few spots. I wet the sponge a little and used the rough side to wear out the paint a bit. No need for sandpaper means no dust allover the place! 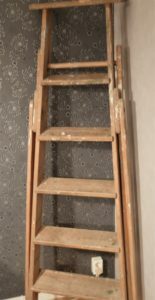 For this ladder I decided not to use wax for sealing the paint. 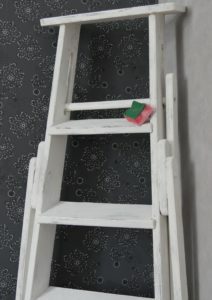 This ladder is for decorative purposes only, so it’ll stay beautiful just like this. If you’re painting a table or a chair for example, you should definitely apply the wax. 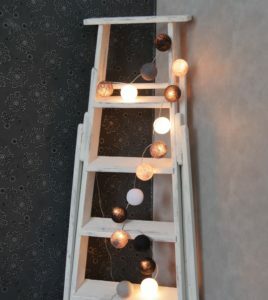 I just added some decorative lights and these now light up a dark corner in our home. What a great upcycle project. And it only took a few hours to do. These cotton yarn balls can be put on regular led lights. I have some as you can see. You get a really calm soft light with these. I like these a lot and it seems that everyone in Scandinavia has them. If you like them, you can find some through amazon right here. 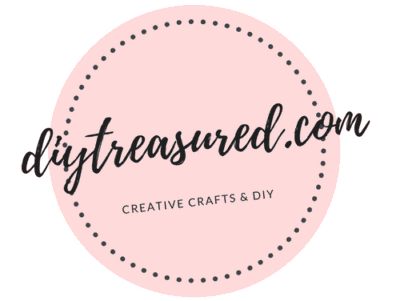 You can easily purchase the supplies for your own project right below here. I picked them out all ready for you 🙂 Hope you enjoy making your own diys! Thank you for visiting us! We are delighted that you stopped by! And thank you for the support. Hope to see you soon again!